Welcome to the OWH Memorial Day Sketch Blog Hop! If you started here, please click the eagle to go back to the start! If you’ve been following along, welcome! If you’re new to my blog, be sure to scroll down to the previous post, for a chance to win! Thanks for visiting – I hope you like what you saw! Welcome to the Quilled Challenge! If you’re a regular follower of my blog, you know that I was fortunate enough to have the opportunity to go to CHA in January (see post here for some great photos). It was a great experience! While I was there, I had the opportunity to quill for the very first time. I had always been intimidated by quilling and was curious about it. I met David and Alli Bartkowski, the owners of Quilled Creations, who were both very nice and great at explaining how quilling worked and showing me it wasn’t as hard as I thought. I was able to buy Alli’s book, Paper Quilling For the First Time (and she even signed it! ), and she showed me how to make a simple heart medallion. Quilled Creations kindly sponsored this challenge (and a prize too, so keep reading to learn how to enter to win! ), and provided Slotted Quilling Tools, two Curling Coaches, and some beautiful paper strips. I mailed everything out to the participants (happy mail!) and everyone got busy on their card. The only rules? They just had to use the quilling paper that I sent. If you’re curious about the colors I sent them, they are: 1/8 inch sage green 111 quilling paper, 1/8 inch jewel tone amethyst quilling paper 1514, and 1/8 inch pink graduated quilling paper 1635. The could create whatever kind of card they wanted… So I’ve been holding my breath to see what great creations they’ve come up with…. So enough chatting – here are the MARVELOUS cards! If all of this beautiful quilling has gotten you inspired, I have great news for you. 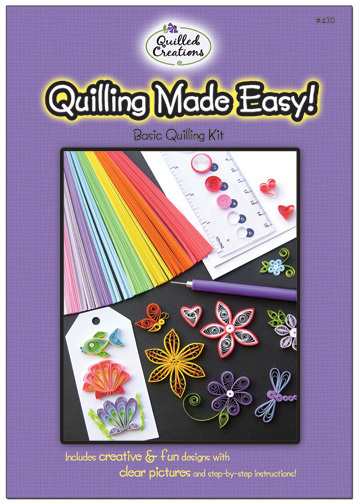 Quilled Creations has kindly sponsored the prize for this blog posting – the lucky winner will receive a Quilling Made Easy kit from Quilled Creations! I enjoyed quilling so much (and the recipients of my cards LOVED them!) that I will be buying a few things. I definitely want the quilling circle template board, the quilling comb, the precision glue applicator (I used a pin and Elmers in a bottle cap), and that beautiful spiral roses kit, and the husking kit… and some more of that beautiful quilling paper!!! The colors were so pretty and I really enjoyed the quality of them. And if you’re in the shopping and inspiration mood, be sure to check out Crafty Card Gallery is an iPhone app (works on iPad and iPod Touch) that is also available for Android Phones. It is a card gallery for handmade cards. You can follow great designers, and look for ideas. It’s updated monthly so there’s always new great content for you… Now featuring over 800 cards!!! and growing every month! New update coming soon! Thanks so much for visiting! I hope you enjoyed our challenge and I hope it inspired you to try something new! Thanks so much to David from Quilled Creations! Happy Mothers Day to all you Mom’s out there! I’ll share a card I made for my Aunt…. You can’t see the card I made for my Mom or Mother in law…. yet… They’ll be posted here on 5/19 for the next Challenge – We’re quilling! The great people at Quilled Creations sponsored the next challenge. It was my first time (and many other’s) quilling… And I’ve seen a few of the projects and they’re breathtaking! You will want to be sure to check back on the 19th… And there will be an opportunity for you to link up a project for a chance at a great prize! So for a chance to win a prize, comment and tell me where you’re from…. Photo paper, chalk inks, and memento ink for the stamp. Both are from Stampin Up. Fake stitching with white gel pen. Pearls from Stampin Up.